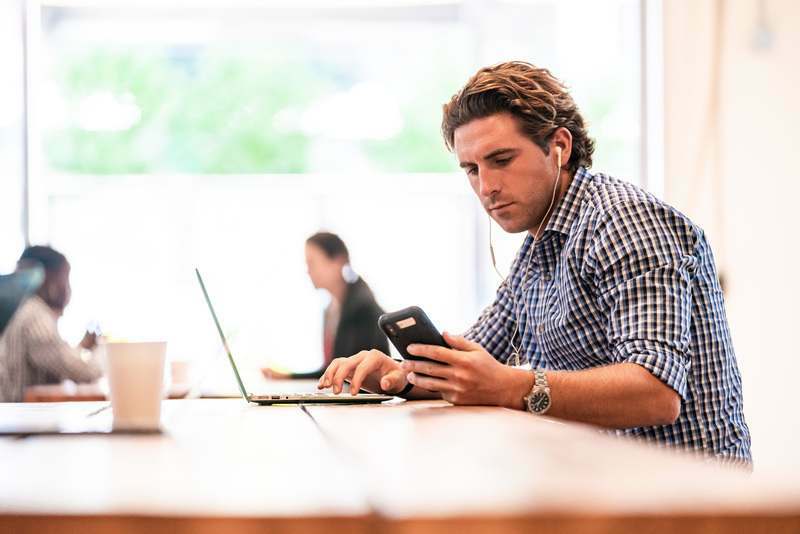 VMware provides this operational tutorial to help you with your VMware Workspace ONE®environment. 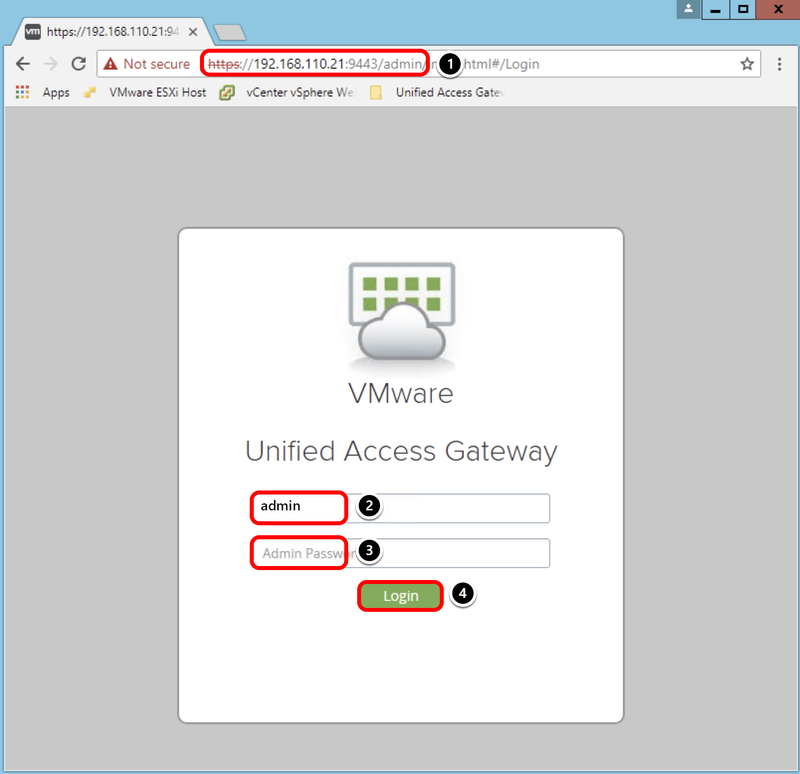 In this tutorial, you deploy the VMware Unified Access Gateway with one NIC using the vSphere Web Client. You also deploy VMware Unified Access Gateway with two NICs using a PowerShell script. 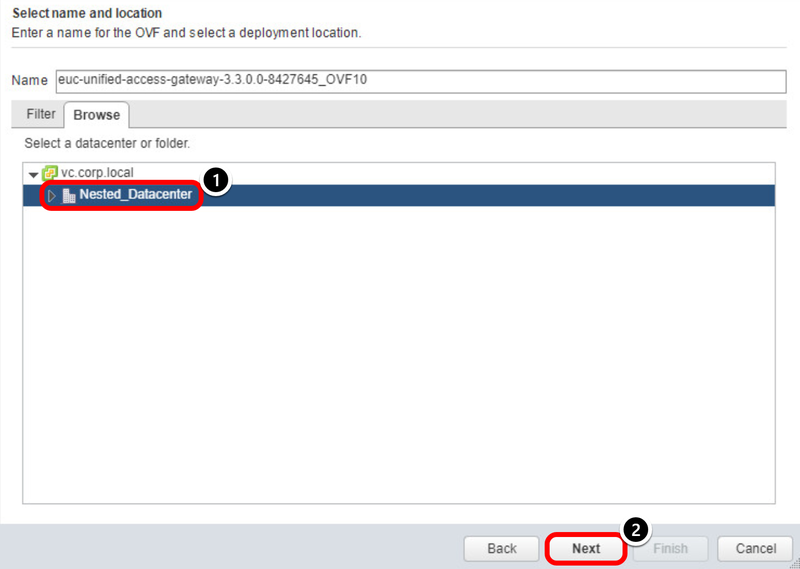 This section guides you through the GUI-based deployment and configuration of the VMware Unified Access Gateway OVF in the VMware vSphere Web Client. 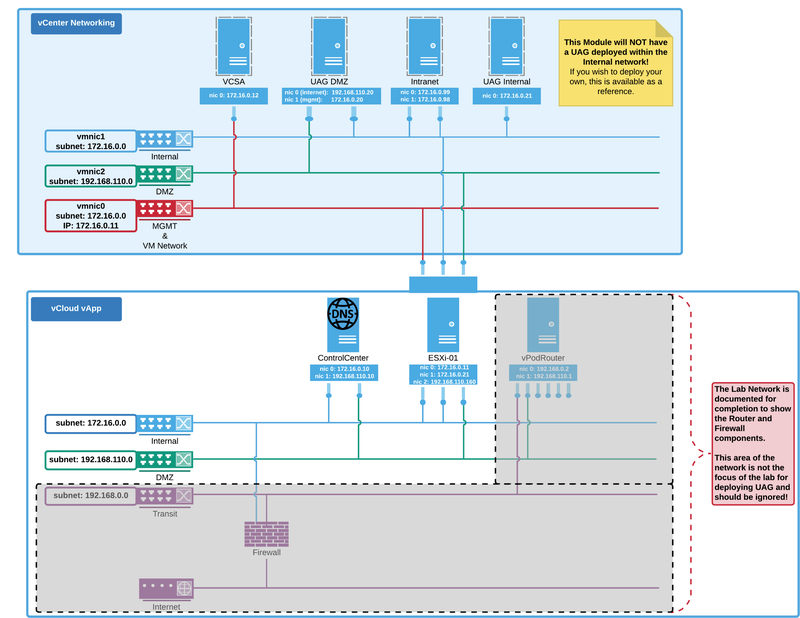 These exercises provide instructions for deploying a Unified Access Gateway appliance in vSphere using a single Network Interface Card (NIC) deployment. The Unified Access Gateway administration console is used to configure the Unified Access Gateway Certificate and change network settings. These exercises cover Unified Access Gateway 3.3.1 deployment in vSphere 6.5 U1. The purpose is to provide a basic deployment option for exploration or proof of concept, to demonstrate available tools in the administration console, and to describe the components that support the features and services. If you want a more advanced deployment with two or more NICs in a production environment, see Deploying Unified Access Gateway with Two NICs Through PowerShell. In this example, external requests to the vApp are sent to the vPod Router, which directs those requests to the appropriate resource, based on the incoming port. Ports 4000-6500 are reserved for the environment components so all traffic coming in on these ports is forwarded to the appropriate Edge Service for the Unified Access Gateway server. In addition, ports 443 and 9443 are forwarded to the Unified Access Gateway server over the respective ports. The vApp networks (internal, DMZ, and transit) are created within the vApp. The internal and transit networks are NATed to the SE-UCS-Network for outbound internet connectivity while the DMZ network routes through the vPod Router for inbound and outbound access. Note that the vPodRouter does not have a NIC on the internal network and thus cannot route external traffic to resources on the internal network. Two sections are provided to explore these options. 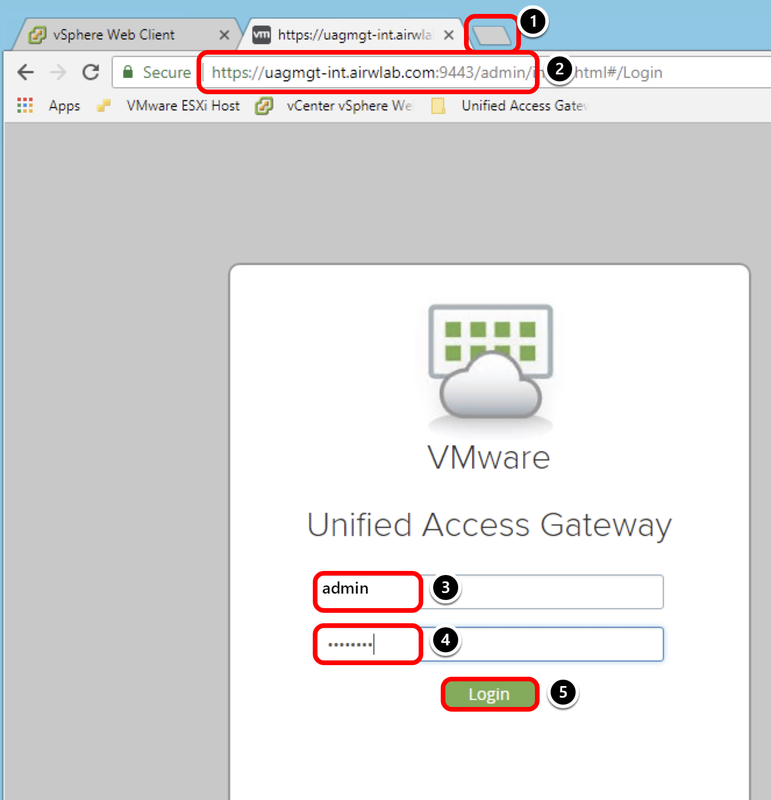 As a first step toward understanding basic deployments, you can install Unified Access Gateway with one NIC using vSphere Client, described in Deploying Unified Access Gateway with One NIC Through vSphere. You can then advance to the next step and install Unified Access Gateway with two NICs as a production environment using PowerShell, described in Deploying Unified Access Gateway with Two NICs Through PowerShell. 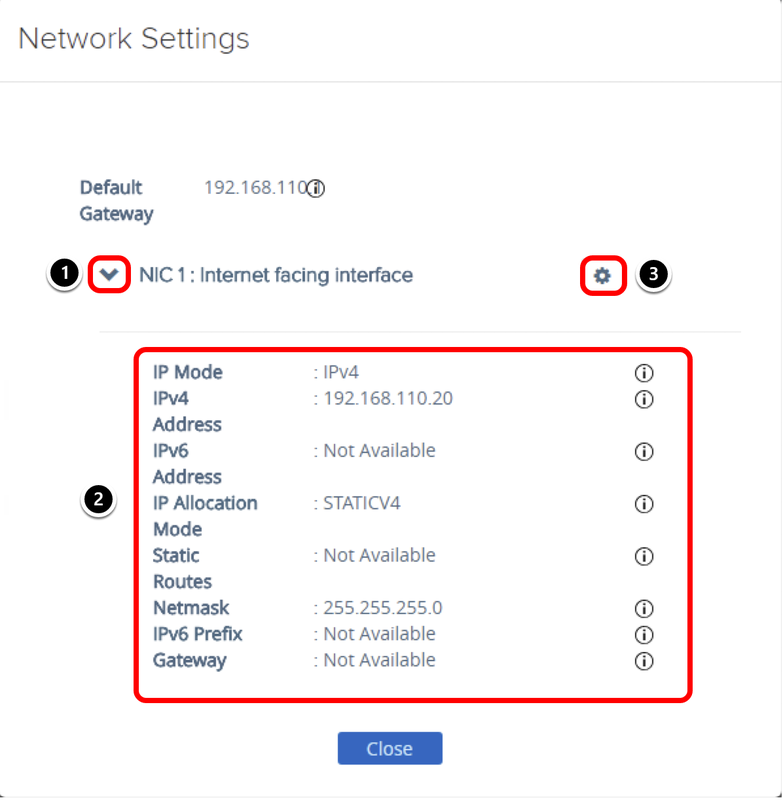 Note: Starting with Unified Access Gateway 3.3, you can deploy Unified Access Gateway without specifying the netmask and default gateway settings in Network Protocol Profiles (NPP). You can specify this networking information directly during deployment of your Unified Access Gateway appliance. In this section, you explore the vSphere Admin UI and learn how to deploy an OVF Template by configuring the necessary fields for the Unified Access Gateway. You deploy the Unified Access Gateway in a one-NIC configuration, meaning that the Internet-facing, internal-facing, and management networks all reside on a single NIC. 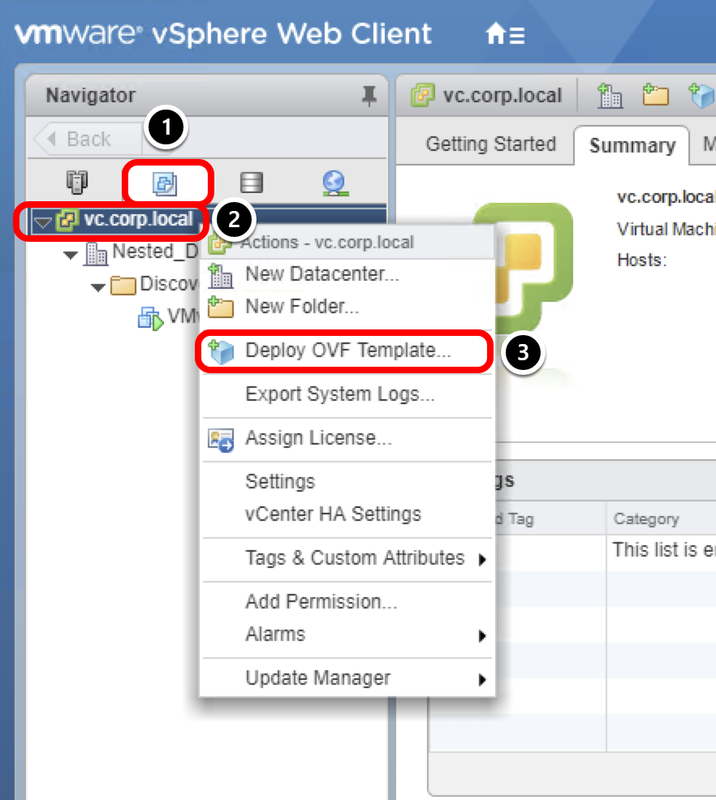 Click the VMs and Templates button. 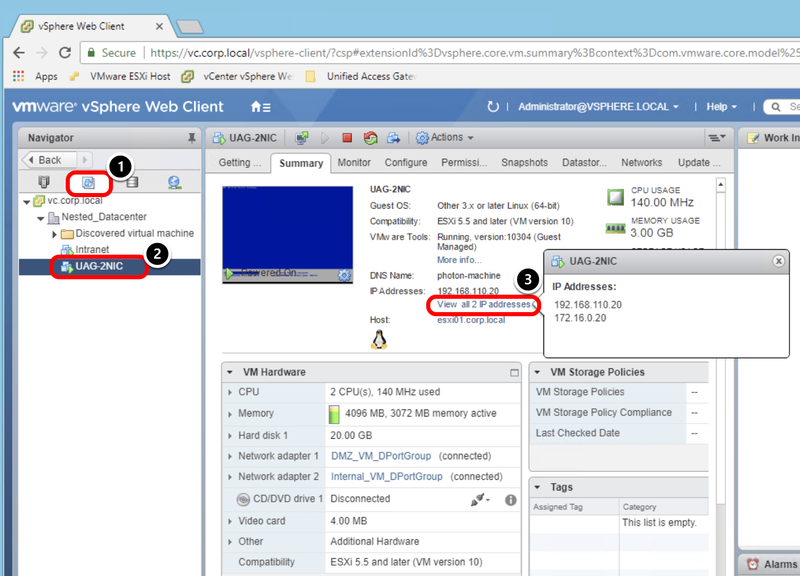 Right-click the vSphere appliance, such as vc.corp.local. Review the details here. These items are updated as you complete the OVF Template wizard. 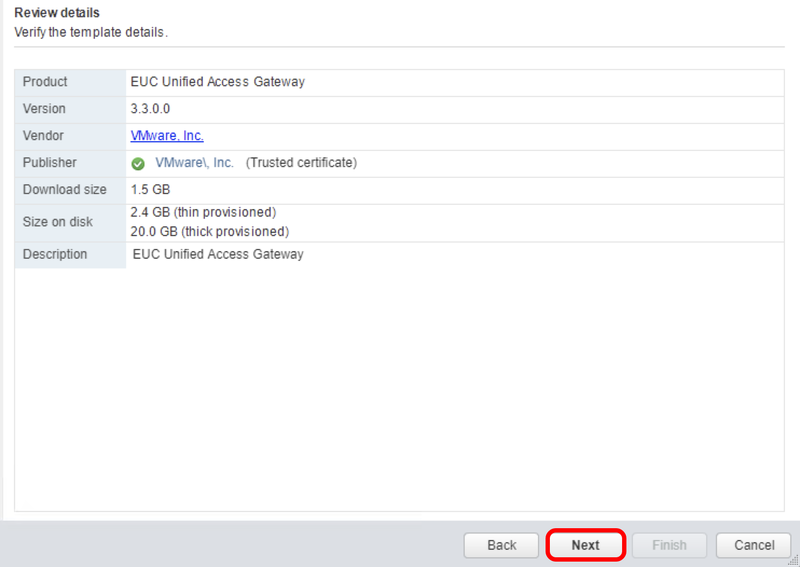 Note: The drop-down menu provides a short description of each configuration and sizing of the Unified Access Gateway VM. 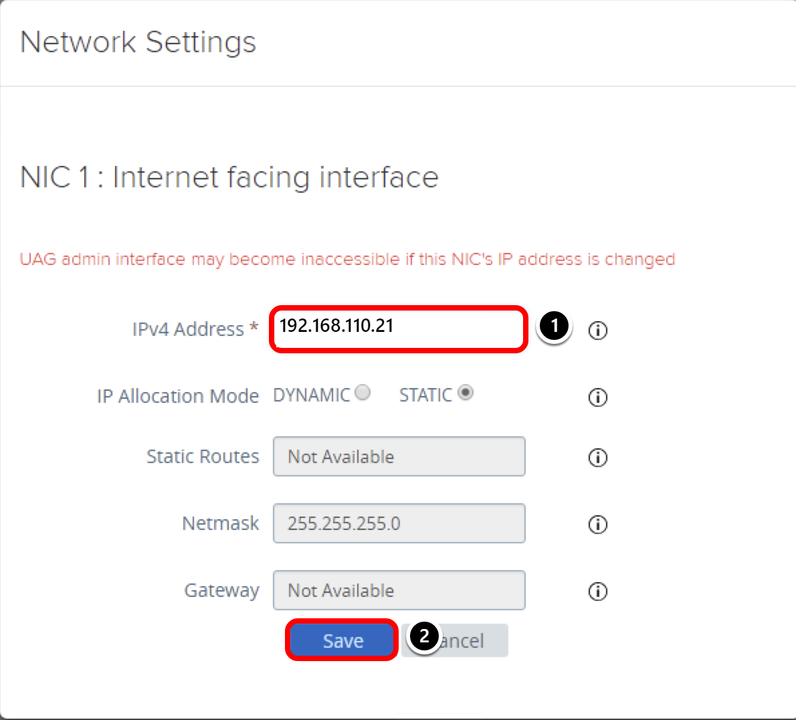 Single NIC: In this exercise, the Single NIC configuration means that all traffic to the Unified Access Gateway is received on the same interface regardless of the source, and the Admin UI runs on the same NIC over port 9443. Two NICs: Directs traffic from external networks to the public interface, and traffic from within the network to an internal interface. The Admin UI runs on the same internal interface. Three NICs: Directs traffic from external networks to the public interface, and traffic from within the network to an internal interface. In this configuration, the Admin UI runs on a separate, dedicated Network Interface. 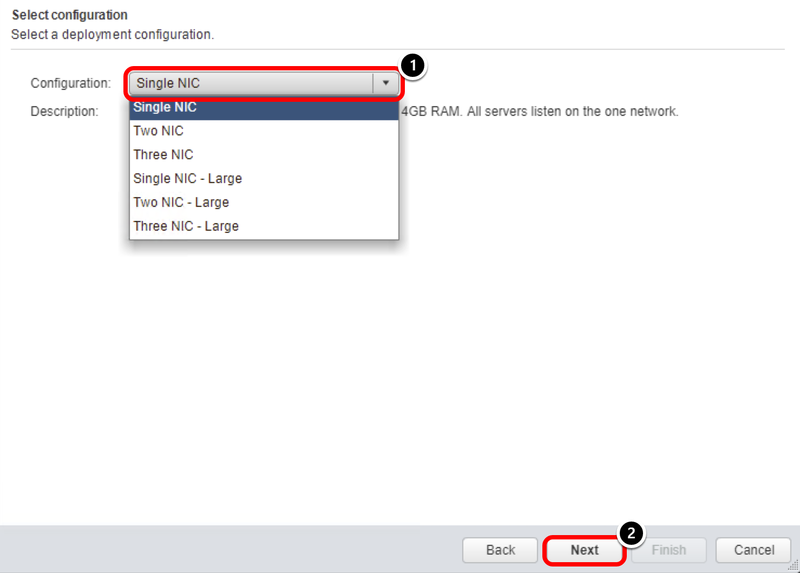 When selecting multiple NICs, you must then configure the corresponding network values for each NIC in the Setup Networks and Customize Template sections later in the wizard. Users who require multiple NICs typically follow this same protocol for other web application servers within their organization. 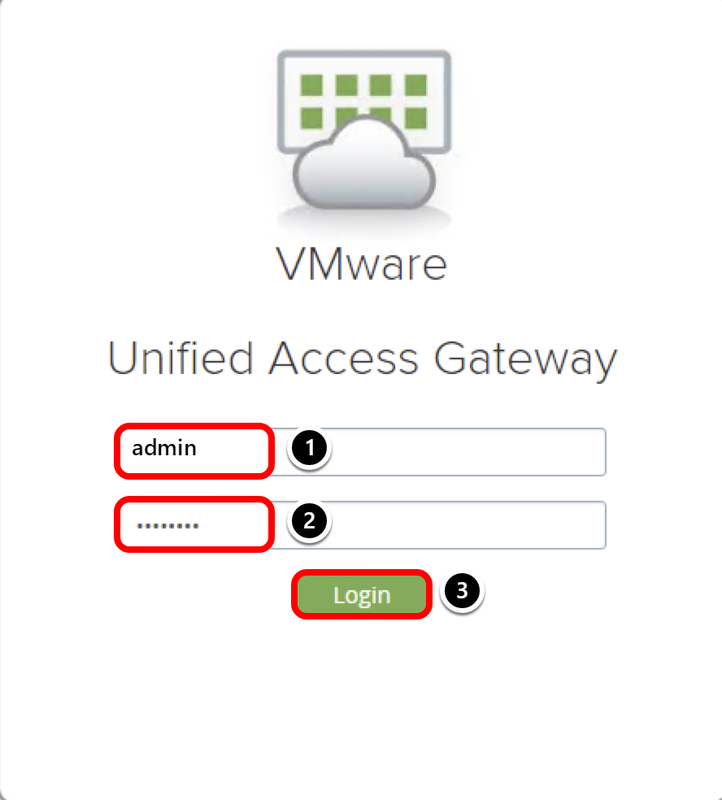 For more information on deploying the Unified Access Gateway with multiple NICs, see Deploying and Configuring VMware Unified Access Gateway. Select a datastore, such as datastore2_ESXi01. For this appliance, select the destination of each source, such as DMZ_VM_DPortGroup in this example. Note: A single-NIC configuration was selected, meaning the Internet, management, and backend traffic all go through one NIC. However, this step of the wizard asks for three destination networks, which leads to some confusion when you are configuring the Unified Access Gateway for the first time. 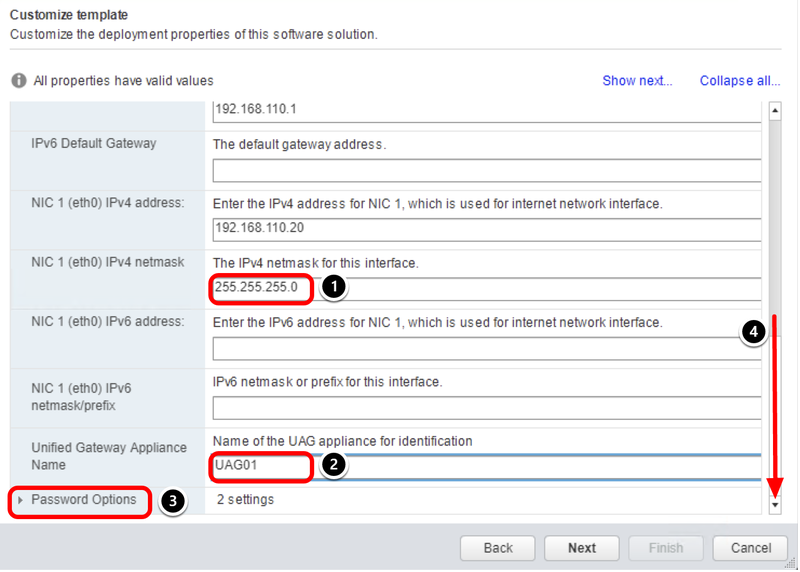 Since this is a single-NIC deployment, select the same network for all the source network. Scroll through the Customize Template and provide the information required. 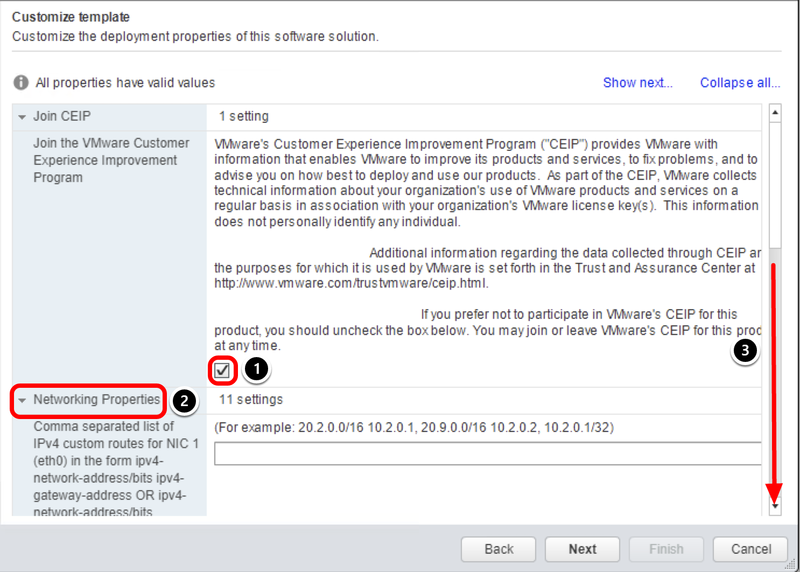 Uncheck the Join CEIP check box. Click the Networking Properties down arrow. Enter the DNS server addresses, such as 192.168.110.10 in this example. Enter the IPMode, such as STATICV4 in this example. Enter the Default Gateway address, such as 192.168.110.1 in this example. Enter the NIC 1 (eth0) IPv4 address, such as 192.168.110.20 in this example. Enter the NIC1 (eth0) IPv4 netmask, such as 255.255.255.0 in this example. 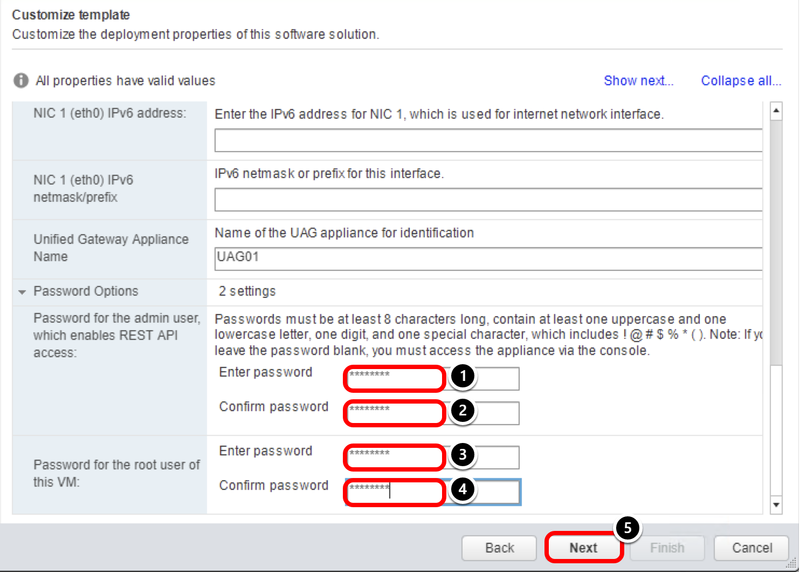 Enter the Unified Gateway Appliance Name, such as UAG01. Enter the admin user, which enabled REST API access. Reenter to confirm the password. 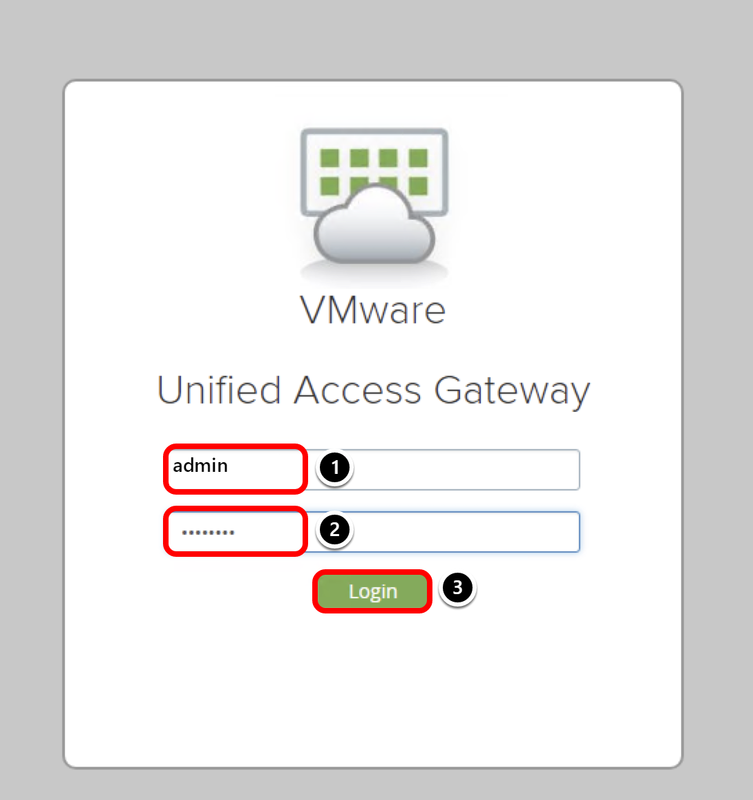 Enter the root user password of the Unified Access Gateway VM. Review all the settings entered in the Network Mapping and Properties windows to ensure there are no errors. 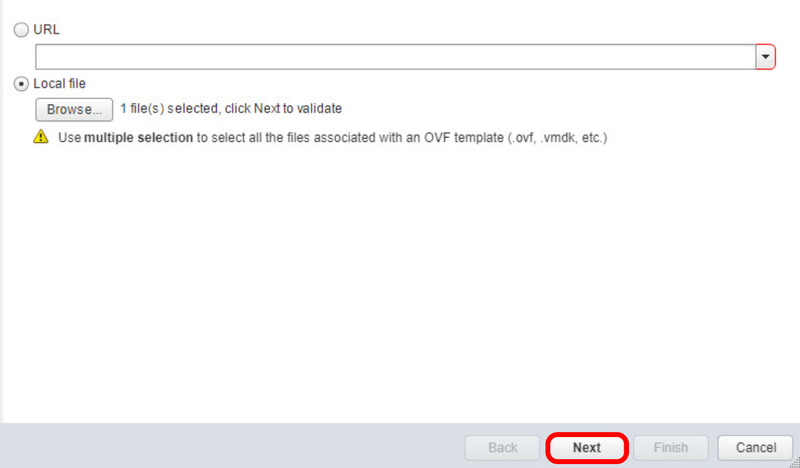 You can follow the status of the OVF deployment through the task console. Wait until the Deploy OVF package and Deploy OVF Template complete. If your Import OVF package task fails with the error saying, "Failed to deploy OVF package" on the Tasks Console, restart the deployment by returning to step Deploying the OVF Template. 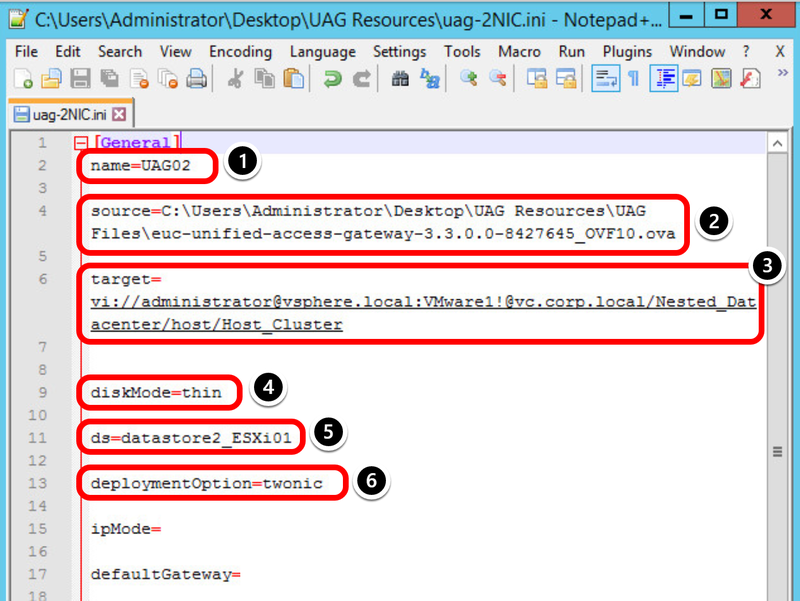 Select the virtual machine, such as euc-unified-access-gateway-xxxx in this example. Click the Power on icon. The UAG VM Screen turns blue as soon the initialization finishes. Wait until an IP address is assigned to this VM, such as 192.168.110.20 in this example. Warning: Do not continue to the next step until the VM receives the associated IP address! This can take one or two minutes. Click the New Tab button. Enter the URL, such as https://192.168.110.20:9443/admin for this example, and press Enter. Accept the security exception and click the Proceed to 192.168.110.20 (unsafe) link. Enter the username, such as admin in this example. Enter the password created for the Admin API in the Deploy OVF Wizard. A successful login redirects you to the window where you can import settings or manually configure the Unified Access Gateway appliance. Under Configure Manually, click Select. 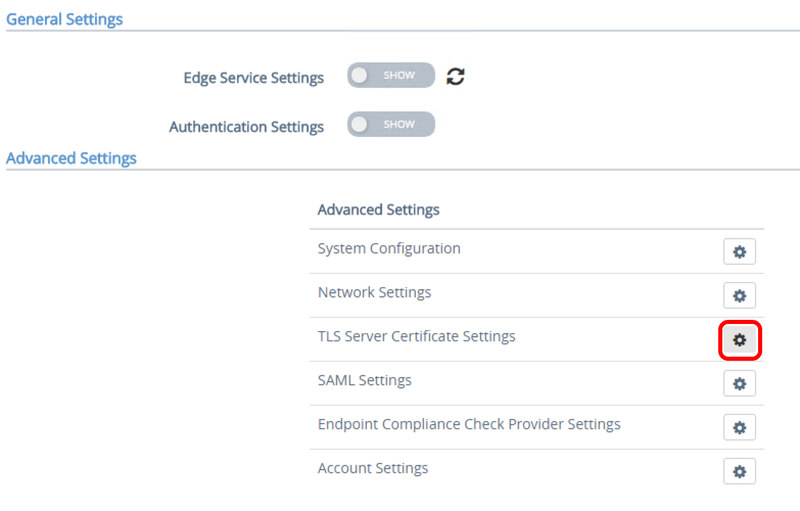 TLS/SSL is required for client connections to Unified Access Gateway appliances. Client-facing Unified Access Gateway appliances and intermediate servers that terminate TLS/SSL connections require TLS/SSL server certificates. TLS/SSL server certificates are signed by a Certificate Authority (CA). A CA is a trusted entity that guarantees the identity of the certificate and its creator. When a certificate is signed by a trusted CA, users no longer receive messages asking them to verify the certificate, and thin client devices can connect without requiring additional configuration. A default TLS/SSL server certificate is generated when you deploy a Unified Access Gateway appliance. At this point, the Unified Access Gateway appliance is using the default certificate, which is not signed by a trusted CA. Under Advanced Settings, click the gear icon for TLS Server Certificate Settings. 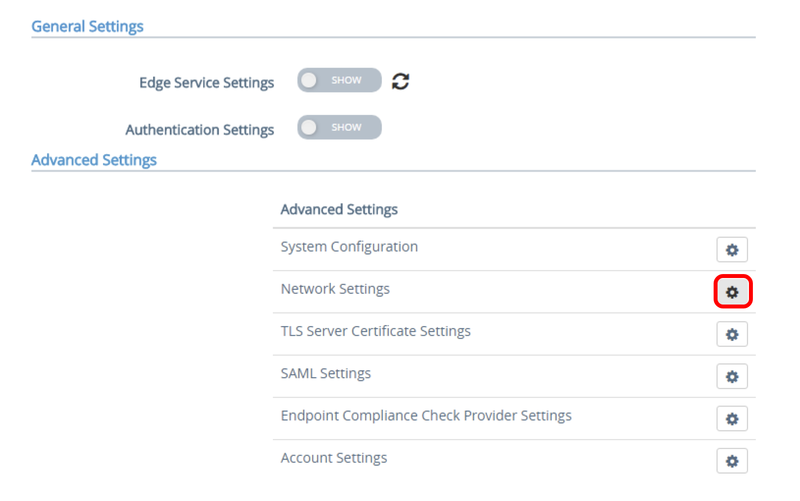 Select the gear icon for TLS Server Certificate Settings under Advanced Settings. Select PFX as Certificate Type. Click Select to upload the certificate in PFX format. 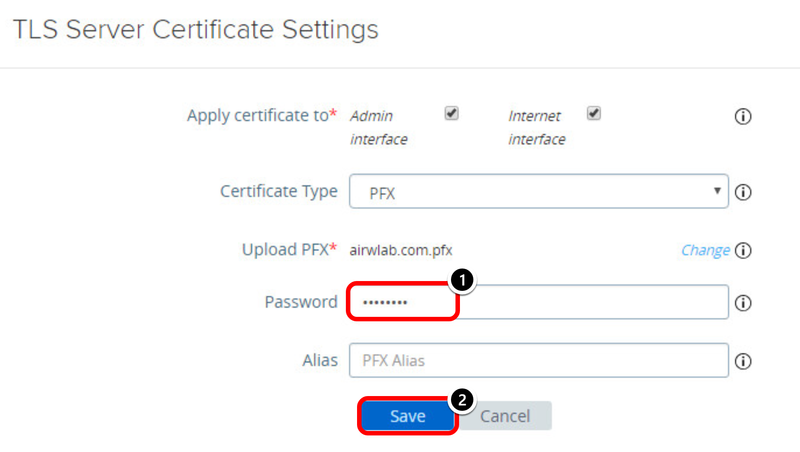 Click the PFX certificate file, such as airwlab.com.pfx. You receive a message stating that the Internet-facing interface certificate has changed. You must reload the administration console to see the changes you made. Click the Close button on the Unified Access Gateway administration console browser tab. Browse to your Unified Access Gateway URL, such as https://uagmgt-dmz.airwlab.com:9443/admin in this example, or click a bookmark if you created one. You should no longer see a certificate error on the Browser navigation bar. 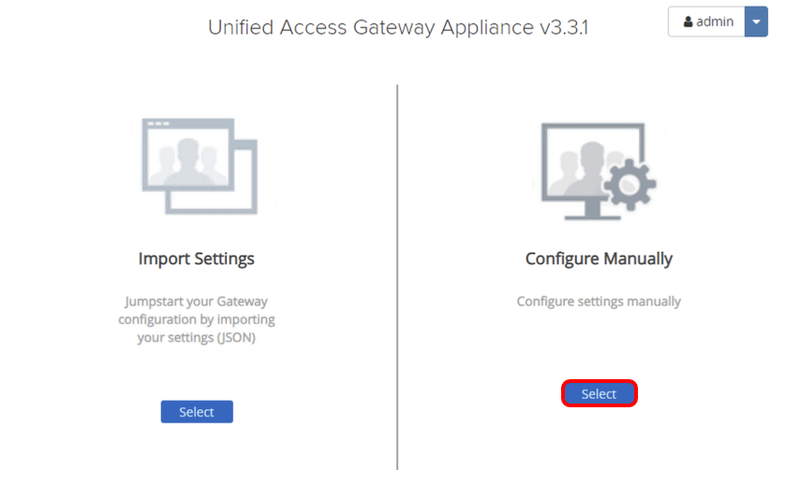 You can now log in to the Unified Access Gateway administration console and update the network settings so that the Unified Access Gateway is deployed on a different IP than originally. 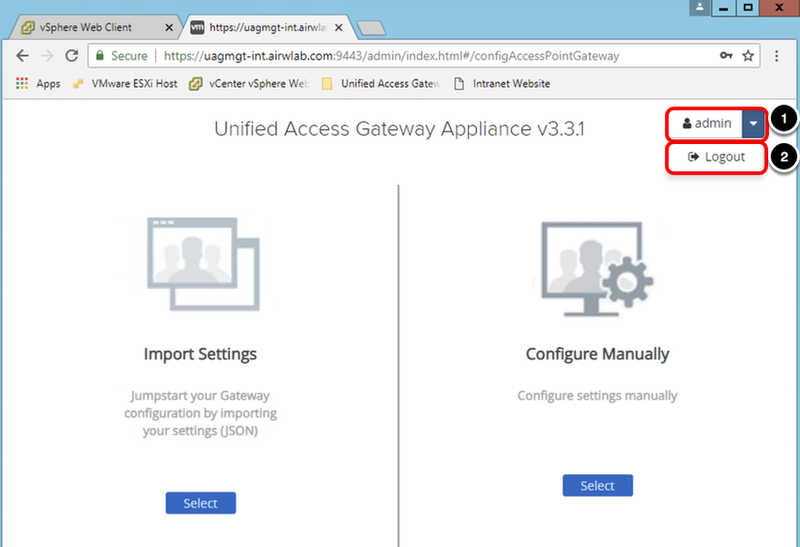 Log in to the Unified Access Gateway administration console (such as https://uag.airwlab.com:9443/admin). Under Advanced Settings, click the gear icon for Network Settings. Click the down arrow for NIC 1, the Internet-facing interface. View the configuration detail displayed about NIC 1. Click the gear icon for NIC 1 to update the IP address. The Unified Access Gateway administration console allows you to update the IPv4 address and IP allocation mode associated to NIC 1. 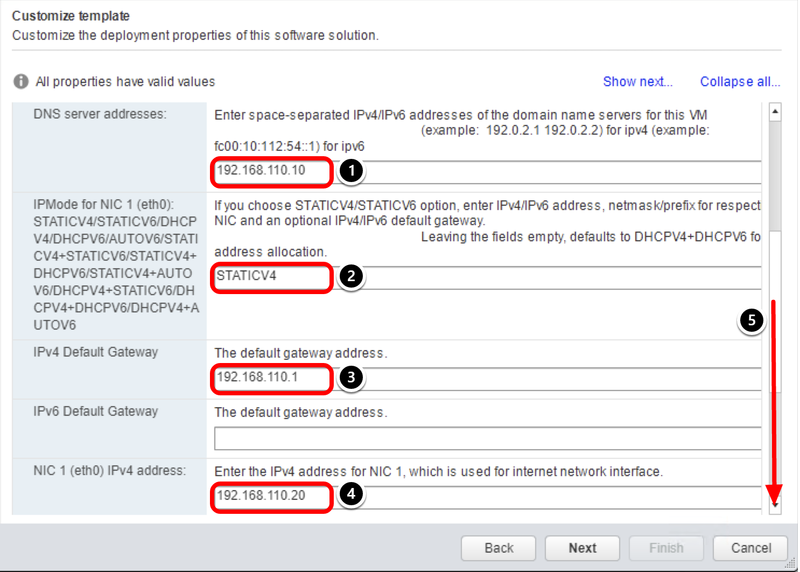 In the IPv4 Address field, enter the new IP address (such as 192.168.110.21 in this example) to update it. After saving, a message appears: NIC1 configuration in progress. This means that the Unified Access Gateway is updating the NIC with the new IP address, and restarting the NIC. Users lose connectivity with the administration console and this message disappears when the configuration is finished. After the configuration completes, click Close. The page automatically reloads on the new IP address you configured for your Unified Access Gateway. You can also enter the new IP manually to navigate to the Unified Access Gateway administration console. Enter the URL to access the Unified Access Gateway administration console, based on the new IP address, such as https://192.168.110.21:9443/admin in this example. You now have access to the Unified Access Gateway administration console using the new IP address. 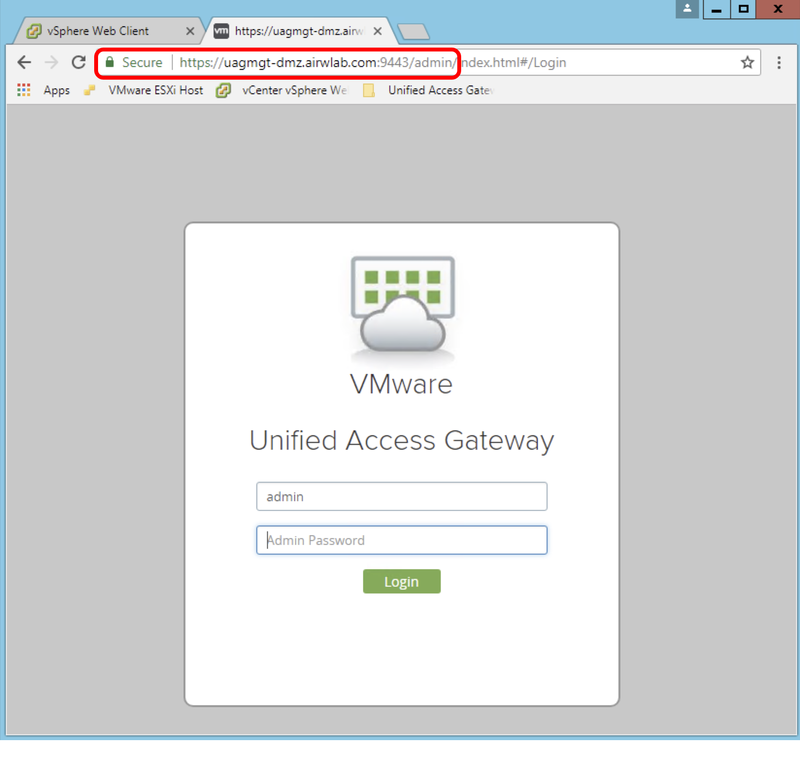 This section guides you through the configuration and deployment of the VMware Unified Access Gateway appliance using a PowerShell script. The exercises also describe how to set up a reverse proxy to access internal web sites through the Unified Access Gateway administration console. In these exercises, the Unified Access Gateway appliance is deployed with two NICs. One NIC faces the Internet, and the second one is dedicated to management and backend access. The purpose is to provide a deployment option for an environment that could be used for production. If you want a more basic deployment with a single NIC for proof of concept, see Deploying Unified Access Gateway with One NIC through vSphere. Starting with version 3.3, you can deploy Unified Access Gateway without specifying the netmask and default gateway settings in Network Protocol Profiles (NPP). 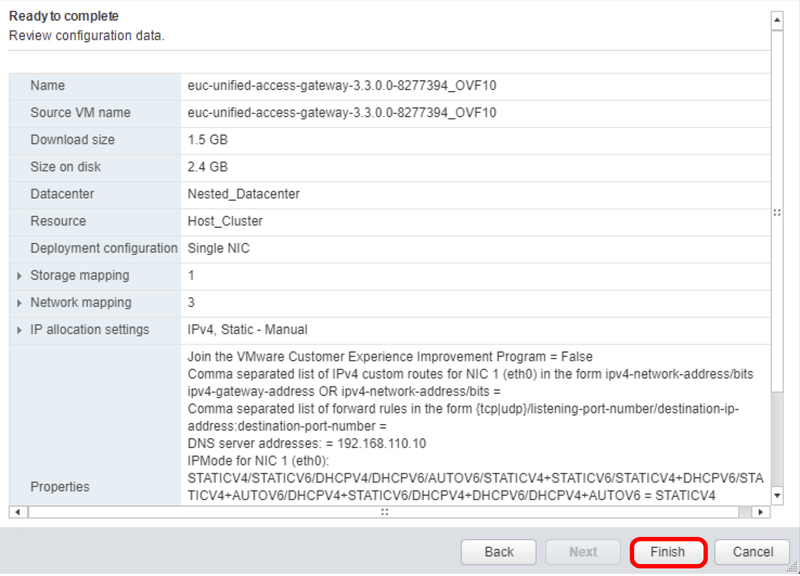 You can specify this networking information directly during deployment of your Unified Access Gateway instance. Click the PowerShell icon located on the Windows task bar. 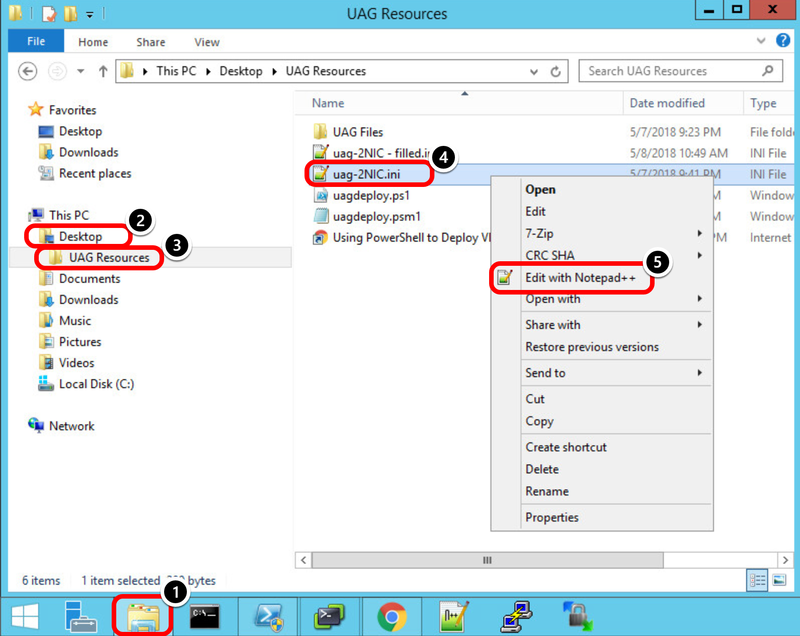 Navigate to the Unified Access Gateway Resources Directory under the desktop user folder by entering cd '.\Desktop\UAG Resources' and then press Enter. In this exercise, you learn how to use the INI file to deploy and configure a Unified Access Gateway using PowerShell, and how to edit the contents of the INI file for your Unified Access Gateway deployment. An INI file containing all of the configuration settings is required to deploy the Unified Access Gateway appliance. 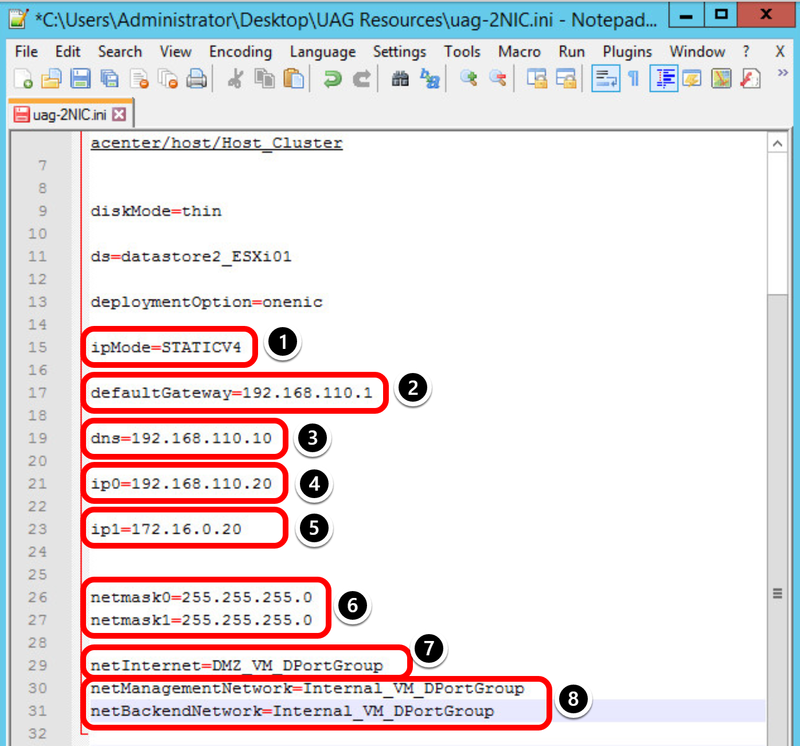 In this exercise, you use the uag-2NIC.ini file to provide the respective parameters for your deployment. You deploy a new Unified Access Gateway appliance called UAG02 in the example, and which has two NICs. NIC1 is Internet-facing and NIC2 is for backend and management. Click the File Explorer icon on the task bar. In the name field, enter a name, such as UAG02 in this example. In the source field, enter the path, such as C:\Users\Administrator\Desktop\UAG Resources\UAG Files\euc-unified-access-gateway-3.3.0.0-8539135_OVF10.ova, and use File Explorer to verify that the OVA file has the name indicated. In the target field, enter the destination path, such as vi://administrator@vsphere.local:VMware1!@vc.corp.local/Nested_Datacenter/host/Host_Cluster. Note: You can replace the password with 'PASSWORD' and the script prompts for the password during the PowerShell execution. In the diskmode field, enter thin. 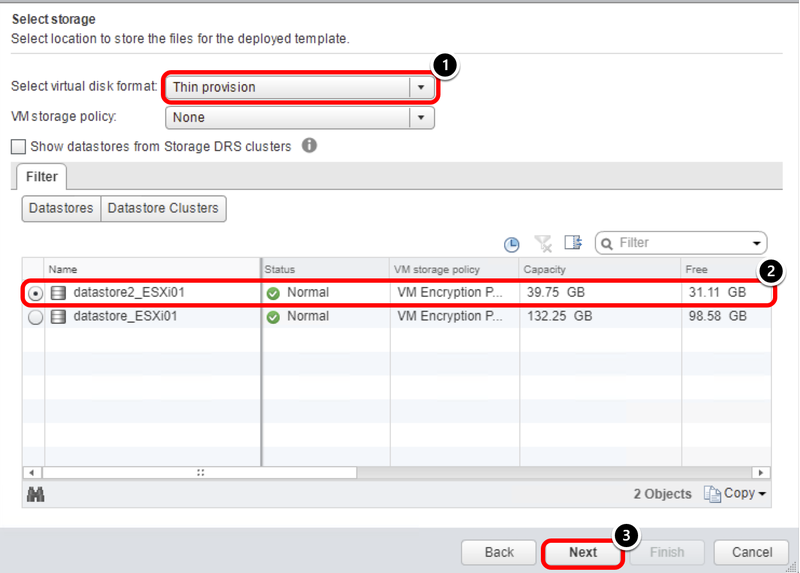 In the ds field (ds refers to data store), enter datastore2_ESXi01. In the deploymentOption field, enter twonic. In the ipMode field, enter STATICV4. In the defaultGateway field, enter the IP address, such as 192.168.110.1. In the dns field, enter the IP address, such as 192.168.110.10. In the ip0 field, enter the IP address, such as 192.168.110.20. Important: ip0 is the Internet-facing NIC. In the ip1 field, enter the IP address, such as 172.16.0.20. Important: ip1 is the internally facing NIC. In the netmask0 and netmask1 field, enter the netmask, such as 255.255.255.0. In the netInternet field, enter DMZ_VM_DPortGroup. 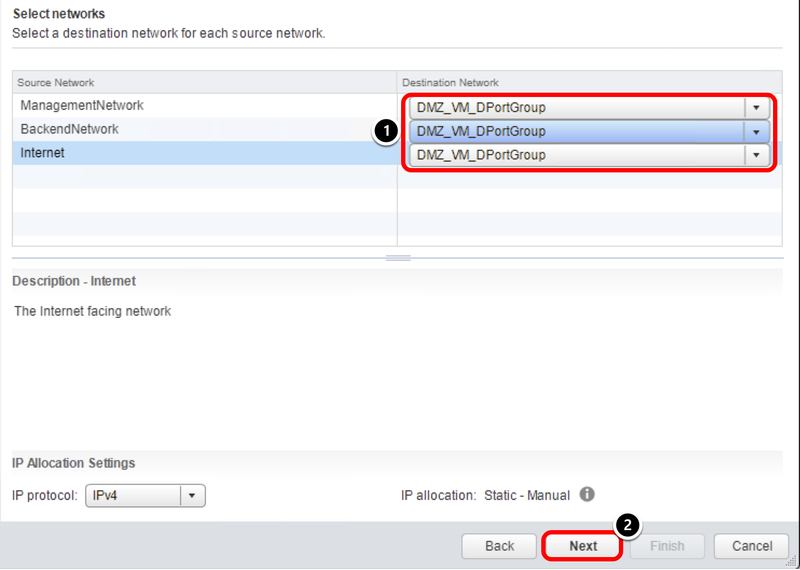 In the netManagementNetwork and netBackendNetwork field, enter Internal_VM_DPortGroup. The SSLCert and SSLCertAdmin contain the information regarding the SSL Certificated for the administration and Internet interfaces. In the pfxCerts field under SSLCert, enter C:\AW Tools\airwlab.com.pfx (this certificate is for the Internet interface). 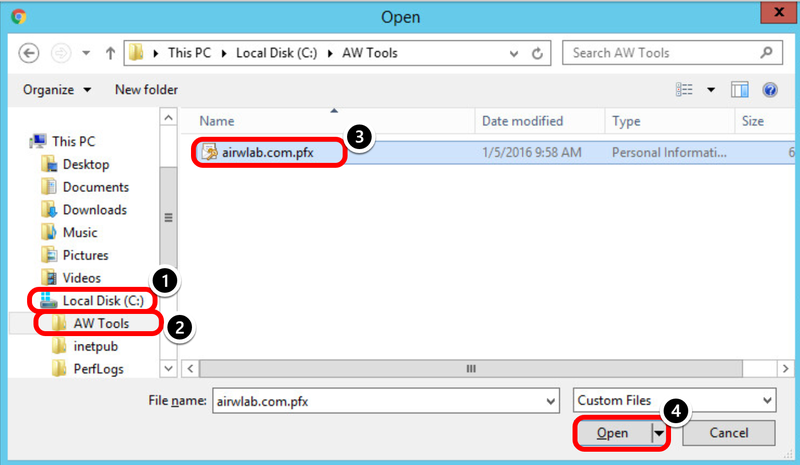 In the pfxCerts field under SSLCertAdmin, enter C:\AW Tools\airwlab.com.pfx (this certificate is for the administration interface). Note: The certificate password is requested during the deployment. 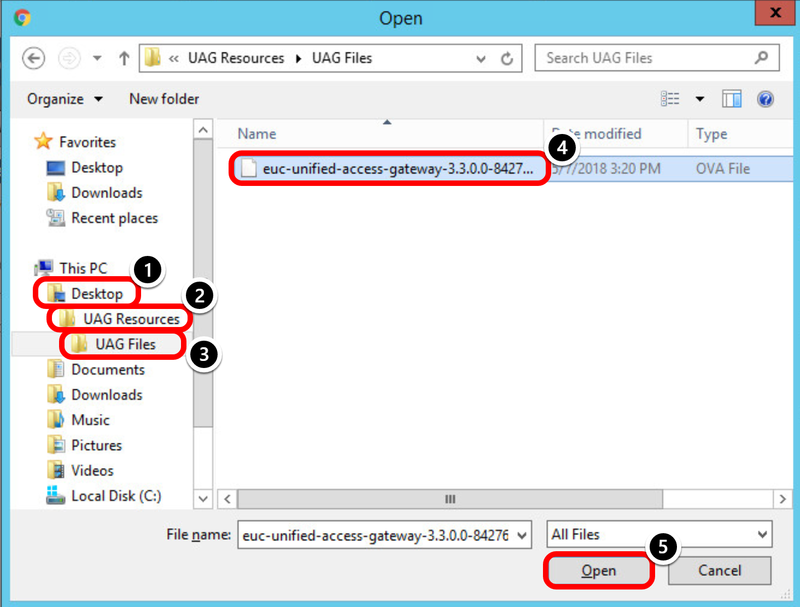 Now that you have configured the INI file for your Unified Access Gateway deployment, you can run the uagdeploy.ps1 Powershell script and provide this INI file as the configuration to automate the deployment. The first VMware1! is the root password for the Unified Access Gateway appliance. The second VMware1! is the admin password for the REST API management access. When prompted, enter the password for the SSLcert and SSLcertAdmin fields. To avoid a password request for the certificate, remove the pfxCerts values and provide a PEM certificate, and set the pemCerts and pemPrivKey for the SSLCert and SSLCertAdmin sections of the INI file. 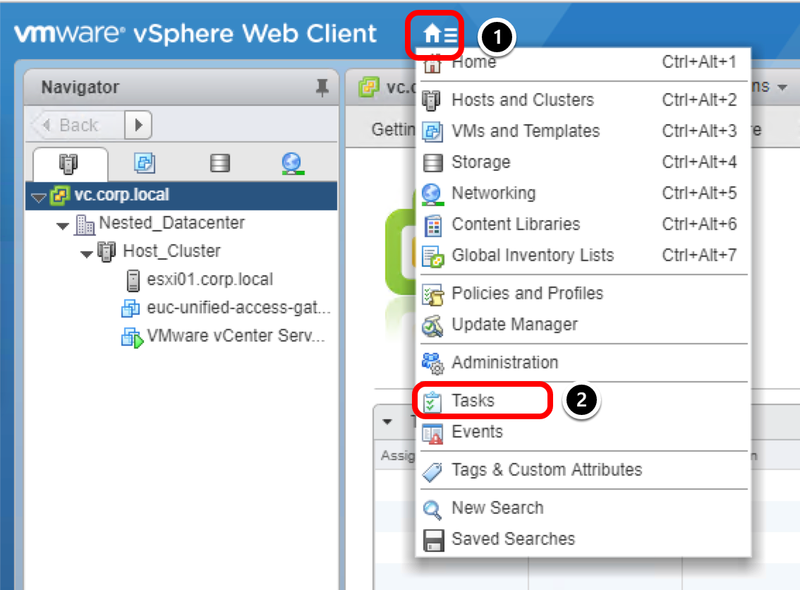 The deployment starts and you can follow the progress on the same window or on your vSphere Web Client, which you opened at the beginning of this tutorial. After successfully finalizing the deployment, the script automatic powers the VM UAG02 on. The Received IP address presented by the script log is a temporary IP. The final IPs for NIC 1 and NIC2 are assigned to the Unified Access Gateway appliance during the first start. 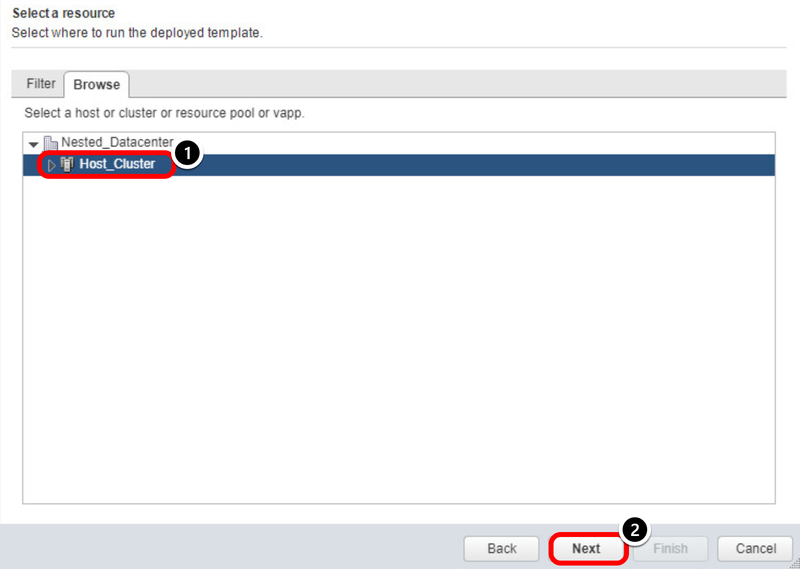 You can return to the vSphere Web Client to validate that as described in the next step. Browse to the Unified Access Gateway Administration Console using the URL, such as https://uagmgt-int.airwlab.com:9443/admin or by clicking a bookmark if you created one. A successful login redirects you to the initial window where you can import settings or manually configure the Unified Access Gateway appliance. 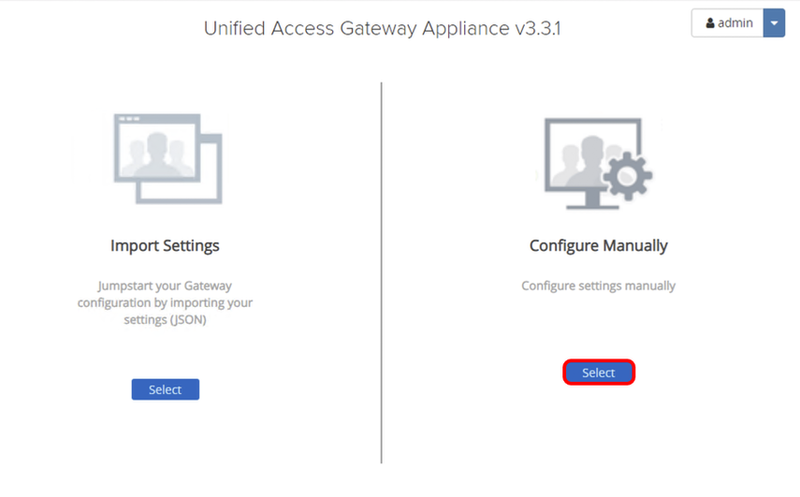 At this point, the Unified Access Gateway has been deployed and you are able to access the Unified Access Gateway administration console to add and change configurations of your Unified Access Gateway appliance. This exercise shows you how Unified Access Gateway can be used as a Web reverse proxy, and can act as either a plain reverse proxy or an authenticating reverse proxy in the DMZ. 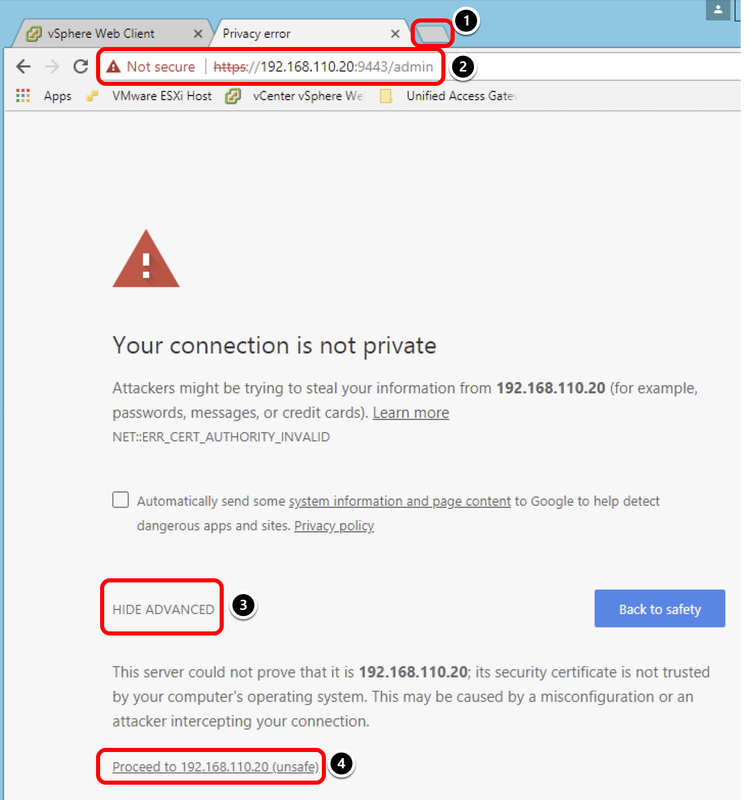 In this exercise, you learn how to set up a plain reverse proxy. 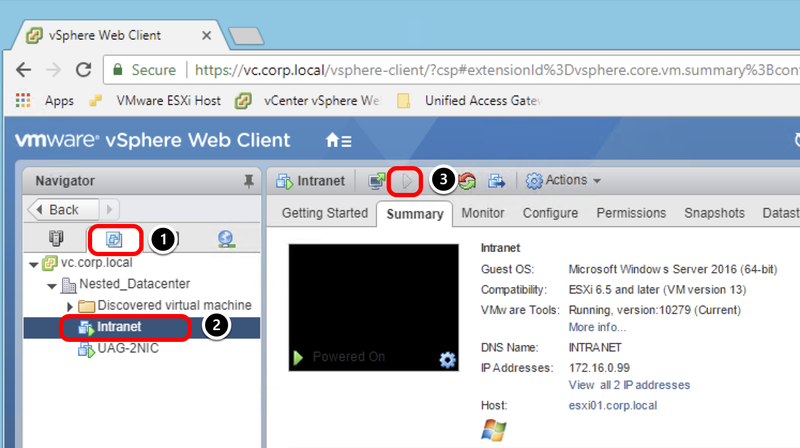 Return to the vSphere Web Client to Power ON the VM Intranet, which is hosted on the internal network to be used as part of the Web Reverse Proxy exercise. Browse to the Unified Access Gateway URL, such as https://uagmgt-int.airwlab.com:9443/admin in this example, or click a bookmark if you created one. Click the Show toggle next to Edge Service Settings. After you click, it switches to display the Hide option. Click the gear icon next to Reverse Proxy Settings. 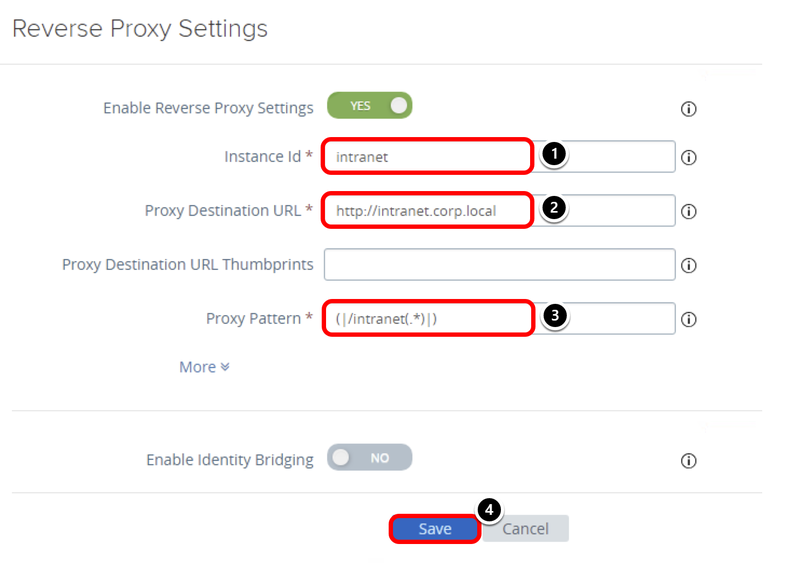 Click Add to create a new reverse proxy settings that can be used to access the intranet. Click Enable Reverse Proxy Settings only. The toggle switches to YES. Note: The Enable Identity Bridging feature can be configured to provide single sign-on (SSO) to legacy Web applications that use Kerberos Constrained Delegation (KCD) or header-based authentication. However, this feature is not enabled for this exercise. Enter the Instance Id, such as intranet, which is a unique name to identify and differentiate a Web reverse proxy instance from all other Web reverse proxy instances. Enter the Proxy Destination URL, such as http://intranet.corp.local, which represent the address of the Web Application. Enter the Proxy Pattern, such as (|/intranet(. *)|), which specifies that the matching URI paths will forward to the destination URL. Additional parameters can be configured for this type of reverse proxy. 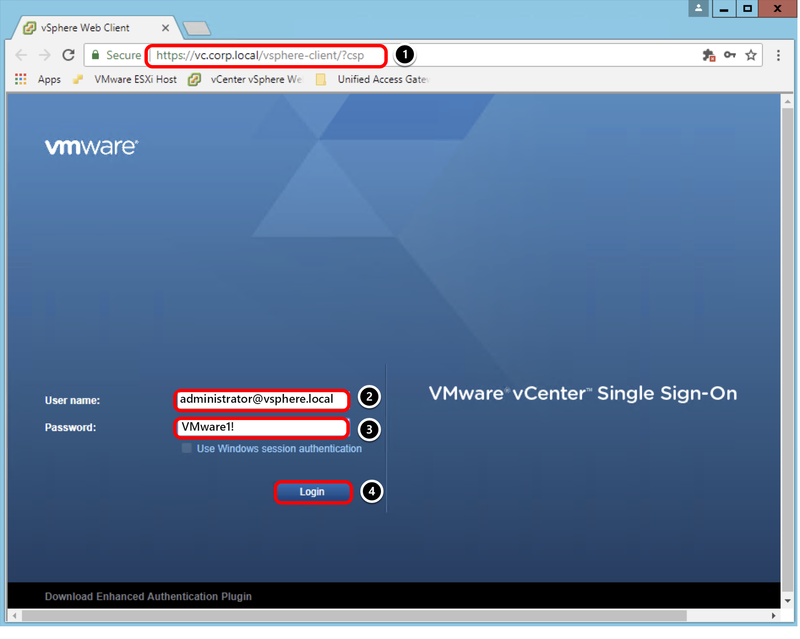 For more information, see Configure Reverse Proxy With VMware Identity Manager. Click the down arrow for the Reverse Proxy Settings. Click the refresh icon for the Edge Service Settings. Confirm that the intranet proxy status is GREEN. 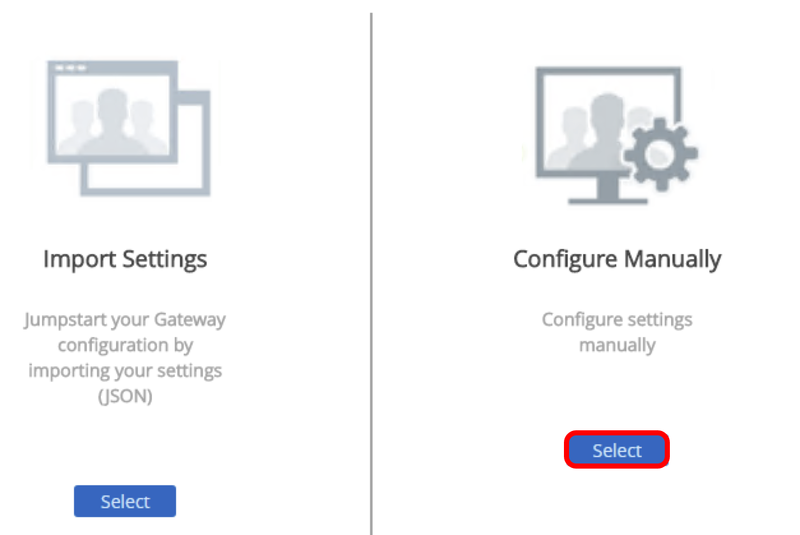 After you add the reverse proxy settings for the intranet, the Unified Access Gateway appliance tests the communication between Unified Access Gateway appliance and the intranet. The status turns GREEN if a connection is possible, and otherwise it shows RED. Important: It can take a few minutes for the intranet proxy to show as GREEN. If you do not see it, click the refresh icon until you see the status change to either GREEN or RED. 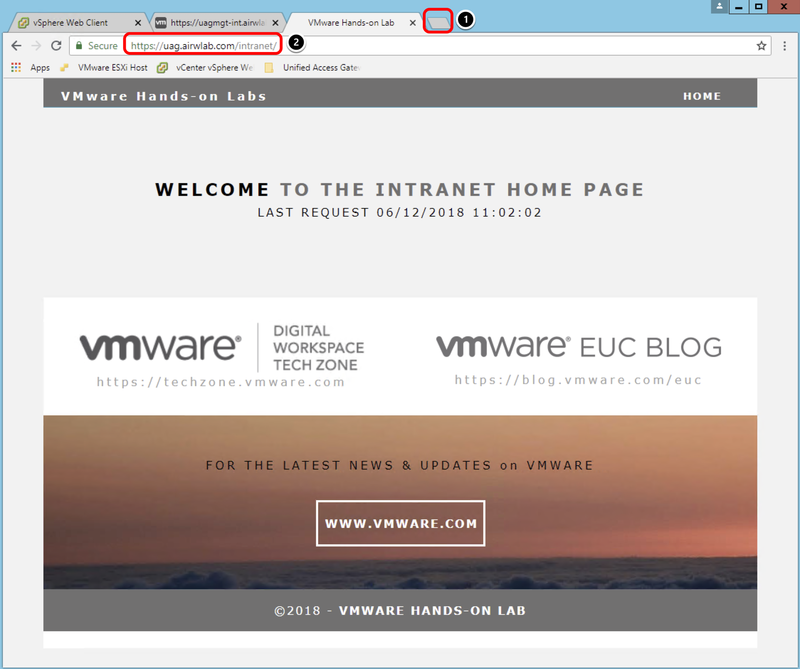 Enter https://uag.airwlab.com/intranet in the address bar and press Enter. Note: The uag.airwlab.com resolves to the IP associated with the Unified Access Gateway Internet NIC, which in this example is 192.168.110.20. The result is a sample intranet page hosted on an internal IIS Server. Access to the intranet goes through Unified Access Gateway port 443, as result of the TLS port sharing configuration enabled by default during deployment. Access to the administration console goes through Unified Access Gateway port 9443 and IP 172.168.0.20 in this example, associated with the internal NIC.